Home / Trip Reports / Appalachian Trail / Appalachian Trail Prep / What is it Like to Sleep in an Appalachian Trail Shelter? What is it Like to Sleep in an Appalachian Trail Shelter? What is an Appalachian Trail Shelter? Appalachian Trail Shelters come in many different styles and sizes. Most are built-in a lean-to style with one wall open to the elements, but here are many different shelter designs in use up and down the trail. Some have covered porches where hikers can hang out, many have bunk beds, or even a second story loft. Normally, you can expect a roof and a wood floor to sleep on. In addition there are usually water sources located near a shelter, such as a spring, a stream, or a river, but not always. Make sure to check your guide or maps beforehand. In addition, most have a privy where you can take a dump to minimize the impact of human feces on the trail and it’s surroundings. Toilet paper is rarely provided, so be sure to bring your own. Bear boxes are usually located near shelters where there is a large bear population. These are designed to store your food during the night. They should not be used as trash bins. People found doing this are usually eaten by non-vegetarian hikers. What the inside of a shelter like? The shelter of the top of the page is pretty typical of what you’ll find on the trail. There’s a flat floor inside and people line up their sleeping bags side by side with their feet pointed toward the door. There’s usually a broom inside so you can sweep the floor clean before you lay out your gear for the night and maybe before you leave the next day. There’s usually a shelf that has the trail register on it and it’s customary to read past entries and to write one about your hike or whatever else you feel like. There’s also usually a map of some kind on the inside of the shelter or arrows painted on the outside walls that point to the nearest water and the privy. Lean-to style shelters like this one have a sloping ceiling inside and it’s very easy to bang your head against one of the shelter cross beams unless you are careful. Older shelters also often have leaks in the walls or leaks in the ceiling. I find that most ceiling leaks are in the middle of the shelter and not along the side walls, but your mileage may vary. When I get arrive at a shelter where I plan to stay the night, I usually carry my gear to the water source first thing and tank up for the night, unless there’s someone there already who can watch my pack and food so animals don’t steal it. After that I unpack all of my gear and set up my sleeping pad and sleeping bag. Then I start preparing dinner, eat, clean up, and hang out until dark when everyone goes to sleep. Why would you sleep in an AT shelter if you carry a tent? People sleep in the shelters for all kinds of different reasons. I like to do it because I often get them to myself when I plan trips on weekdays and can avoid the thru-hiker pack. But there are other times when I want to be social, or I can’t bothered to set up my shelter in the pouring rain. If I’m hiking in a very remote area, like up in Maine, sleeping in a shelter can also be comforting at night. On any given trip, if I think I’m likely to camp in AT shelters, I tend to bring my lightest shelter possible, a 9 oz tarp. There’s no point in carrying anything heavier if you’re unlikely to use it. What do you do with your food at night? If I’m alone in a shelter in bear country, I usually hang my food bag in a tree outside of the shelter, unless of course, there is a bear box nearby. 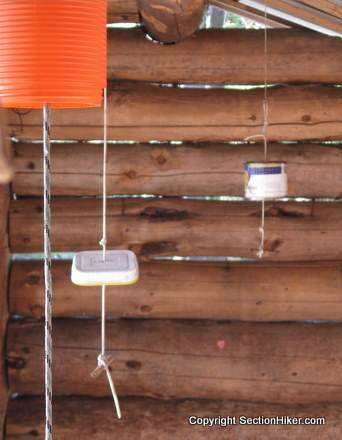 If there are other hikers staying in the shelter, I’ll usually hang my food on one of the many strings that hang near the front of shelters and have tuna cans on them, to prevent mice from jumping from the string to your food bag and eating all of your food. Where are the shelters located? Shelters or designated campsites are usually located every 10-15 miles along the AT, but there are exceptions. When you need to camp someplace else, try to use Leave-No-Trace principles. Is it safe to sleep in an Appalachian Trail Shelter? By and large yes, but the chances of being disturbed by non-hikers staying at the shelter or staying up late increases the closer you are to a road. A lot of hikers avoid these shelters for this reason, but they can be fine during weekday nights. How many people can a shelter hold? AT Shelters can vary widely in size, but they can usually hold a minimum of 6 hikers. However, some are very large and can sleep up to two dozen hikers. Where can I camp if you don’t want to sleep in the shelter, but want to be near people, water, or a privy? There’s usually an area adjacent to shelters with spaces designated for tent sites. If you arrive at a shelter and it’s full for the night, you can usually find a tent site outside for the night. I find it’s best to carry some alternate form of shelter, instead of relying on shelters, in the event they are full or you feel uncomfortable with the people sleeping in the shelter. What if someone snores so loudly that you can’t sleep? You can trying rolling them over or hitting them for a while, but if that fails, it’s probably best to set up your own shelter outside and sleep out of earshot. Staying awake and angry all night is not worth it. Loud snorers should avoid sleeping in shelters to be courteous to other hikers. Is it ok to burn a fire at a shelter? This really depends on the local regulations in the areas you’re hiking through. I’ve never had a fire at a shelter even if it had a fireplace, because it scars the ground. I just use my stove to cook with and go to sleep when the sun sets. How bad are the mice in shelters? I’ve only seen a few mice in my experience and they didn’t bother me. If you’re afraid of them, you can sleep under mosquito netting or skip the shelter and sleep in a test outside. I haven’t heard of a case of hantavirus in a shelter on the Appalachian Trail, but if it’s a concern, sleep elsewhere. What else would you tell someone about shelters on the Appalachian Trail? Please leave a comment.